The Blossom is a progressive-acoustic-folk band formed as an offshoot of Lyrian in 2010. After five years, their first album, The Shepherd’s Calendar, was released on 1 May 2015. 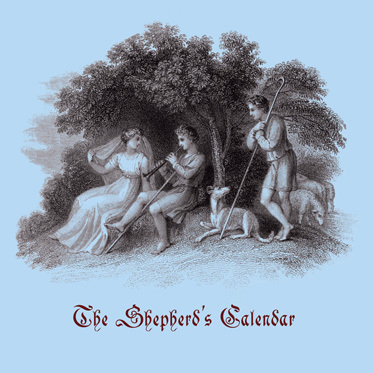 The title of the album, and the structure of twelve songs, one nominally for each month of the year, are inspired by Edmund Spenser’s The Shepheardes Calender (1579), and the themes of the songs are similarly pastoral. Like Spenser’s poems, they seem to treat of rustic concerns, the animals of the field, the lives and loves of shepherds and the beauties of the English countryside. But all is allegory and myth. With pipes and drums, strings and voices the band has tried to conjure love and hate, faith and folly, joy and misery, magic, merriment and murder. Song of the hare, for example, describes a great battle between two mighty animals and the antics of the beasts around them, while Lord of the marsh is a story-song in the tradition of the ‘Child ballads’, telling of the abduction of a girl by a magical lord disguised as a pedlar, and its aftermath. Other songs touch on the mysteries of memory and the fleeting of time. The lyrics of the songs are included in a thirty-two-page booklet issued with the CD, illustrated with a selection of beautiful images stolen from books of the late romantic period (around 1820–1850). Copies of The Shepherd’s Calendar can be acquired as a physical CD for £6.00 from eBay, Bandcamp, Amazon or directly from Medieval Records. It can also be downloaded for $9.99 from iTunes, CD Baby, Bandcamp and all good (and evil) vendors of virtual music.